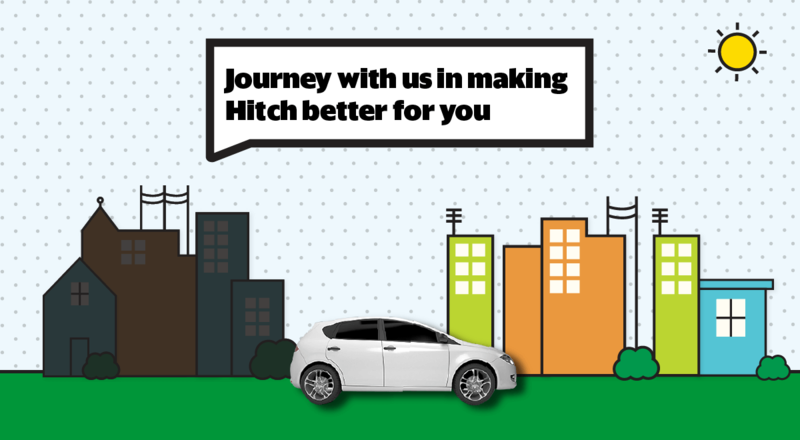 Over 2 years ago, we introduced GrabHitch as our social carpooling initiative that brings everyday commuters together to benefit from a sharing economy. It has not been an easy journey trying to change social norms. But we did it. Today, we are the largest social carpooling community in Singapore. We have lowered barriers between strangers. We have lowered your driving costs. We couldn’t have come this far without you. We are now ready for our next wave of development, one that has to be sustainable at its core. To keep our community going, we will be implementing a 10% platform fee on all GrabHitch rides from our drivers starting from 1 June 2018. Your contribution helps us to fund our operating expenses and invest in various initiatives and product enhancements with a sole objective – to channel value back to you in greater fold. We seek your support in moving forward together. 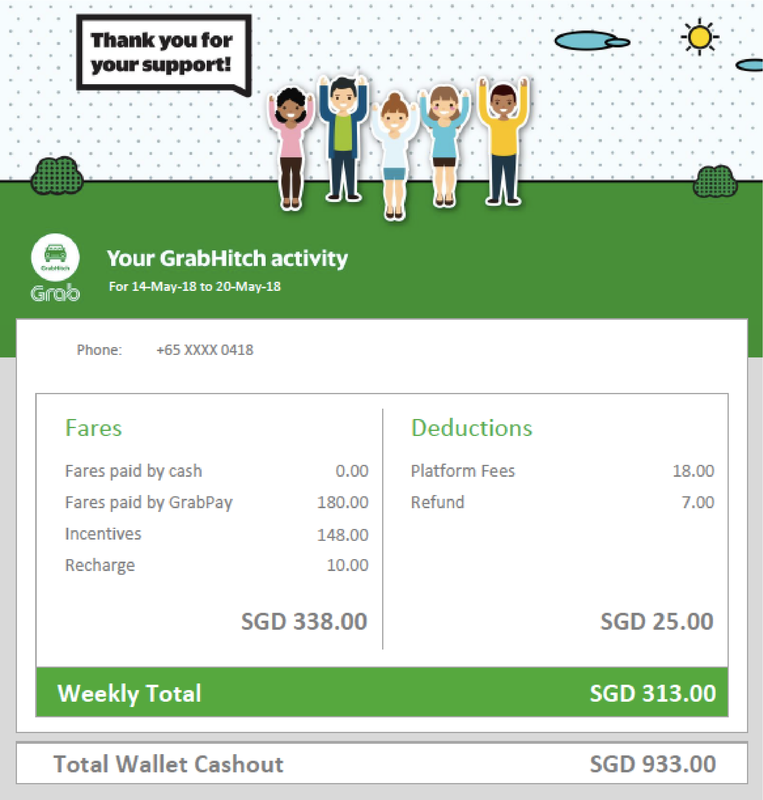 What is GrabHitch’s platform fee? A contribution that we require from our GrabHitch drivers for the sustainability and improvement of our service and is currently set at a flat rate of 10% on the original fare amount. Platform fee will take effect on all GrabHitch rides from 1 June 2018 00:00:00. How will the process be like? 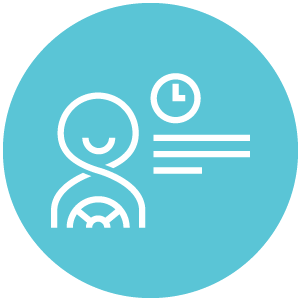 Platform fees on all rides completed within the same day will be collected from your driver wallet in 1-2 working days. Here’s an illustration to help you understand better. 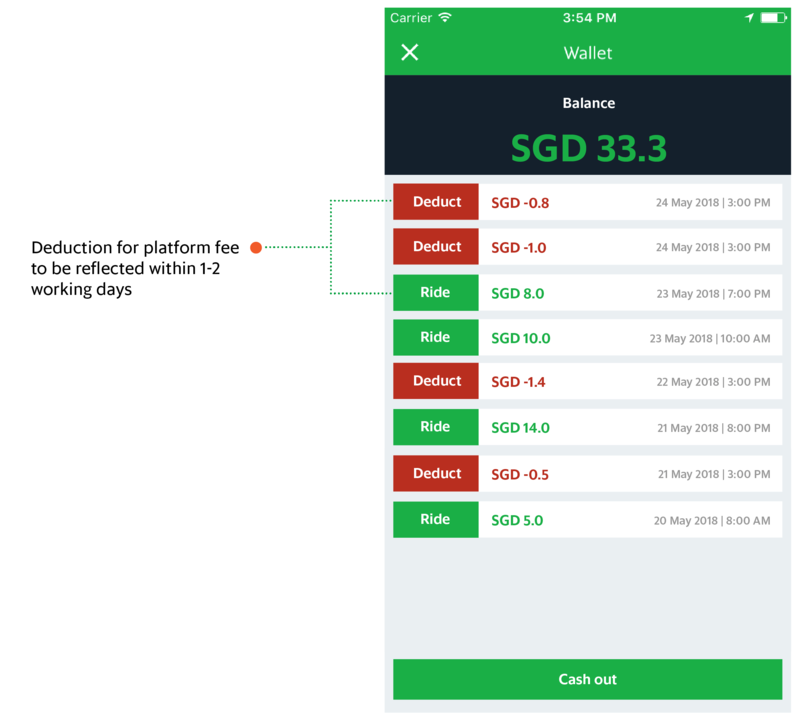 What will GrabHitch do with the platform fees collected? What’s in it for me? We will use the fees to cover our operating expenses and invest in product development which ultimately brings value back to you in the form of better matches, reducing last minute cancellations and no-shows from riders etc. Will my incentives and bonuses (e.g. monthly active bonus) be charged a platform fee? Absolutely not! Any incentives and bonuses that you are eligible for will not be subjected to a platform fee and are 100% yours to keep! How can I see the amount of platform fee that I contribute per ride and in total? The amount collected will be reflected in your driver wallet within 1-2 working days after completing the ride. Furthermore, you will receive an e-statement from us every Thursday showing your contribution for Monday to Sunday from the previous week. 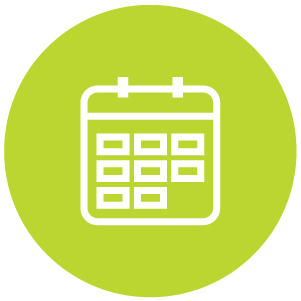 If a Thursday falls on a public holiday, the e-statement will be sent to you on the following working day instead. An online statement that shows the previous week’s summary of activity including rides completed, fares and platform fees. You’ll also get to see your cash-out weekly total, incentives earned and refunds if any! Are there any changes to the cashout process? Nope, your cashout amount will still be reflected in your bank account within 10 working days. How will my cash rides be subjected to platform fee? All rides (i.e. both cash and GrabPay) will be subjected to a 10% platform fee which will be collected via your driver wallet. What happens if I have a negative balance in my driver wallet? Will I be banned? Nope, you won’t be banned. However, you’ll not be able to view cash bookings temporarily when this happens. Simply complete GrabPay rides to bring your wallet balance back to positive and you’ll regain full access to all bookings within the next 1-2 working days. I accidentally completed a pickup and need to refund the ride! Will platform fees be charged for refunds? Of course not! Call us at +65 6655 0005 or email support.sg@grab.com to let us know. 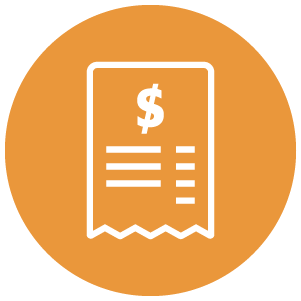 Once verified, we’ll credit back to your wallet the corresponding platform fee by the next working day. Can I top-up my driver wallet? This feature is currently not available. Complete a GrabPay ride to top up your driver wallet!